represents a well-documented model for improving overall health. please call or contact me for an appointment. The true beauty of this technique lies in its simplicity, we let the oils do all of the work. This technique is not a massage, or works on the muscles, it is a feather-light touch, spreading the oils on the spine and the feet. Different factors that we face in our daily life can have an impact on our overall well-being. 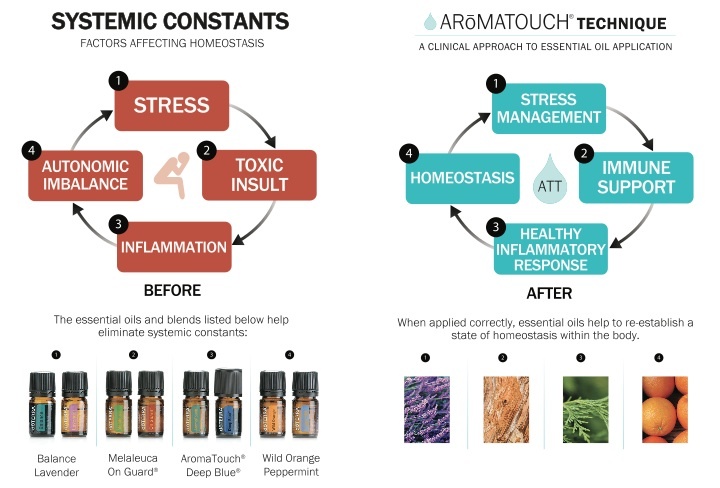 When dealing with a child who needs individual care, a friend frustrated with school a spouse with stress from work, or a teenager worn out from soccer practice, the AromaTouch Technique is a wonderful way to help support the body. The technique has multiple benefits from the eight specific oils used in combination with human touch. no matter what situation comes, you can feel empowered knowing there will always be the AromaTouch Technique.